Jaimie L. George – Olds Russ Marquette & Peace, LLC. Jaimie George became a member of the Pennsylvania bar in October 2010. 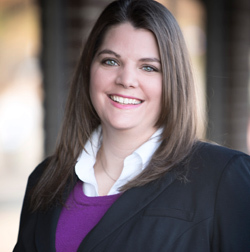 Since her admission to the bar, Ms. George has worked as an associate for Attorney Edward Olds where she has concentrated her practice on employment and constitutional law issues. She has appeared before state and federal court judges as well as several administrative agencies and school boards to advocate on behalf of aggrieved individuals. Ms. George has represented individuals who needed assistance in filing charges of discrimination, obtaining unemployment compensation benefits, applying for Social Security Disability benefits, acquiring reasonable accommodations under the ADA and/or requesting leave under the FMLA, and establishing and effectuating plans to address the needs of special education students. She also has experience advocating on behalf of individuals who believe their constitutional rights were unjustly denied due to discrimination, retaliation, police misconduct or arbitrary government action. If you need assistance in any of these matters or have a related issue, please contact Ms. George.